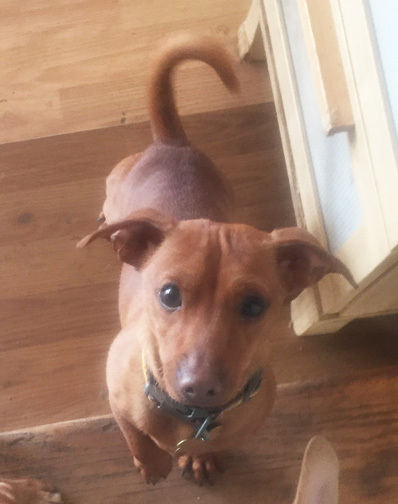 Northern California — Southern California Dachshund Relief Inc. PLEASE DONATE TO HELP OUR RESCUES! We have many dachshunds fostered in Northern California. If you live in Southern California, you can still adopt them! Please inquire and we might be able work with you to transfer them down to where you live, or you can pick them up. Please contact us for more info. Size: Tweenie – 15 lbs. Peet is a stunning dog. Soft coat and soft personality. However, he is going to require a very specific type of home. Peet was with his breeder for 5 months and he missed out on early socialization to new people and new things. He was then purchased by a woman who gave him the best medical care and who loved him to bits. However, she would be the first to tell you she is not an alpha owner, which is something Peet desperately needs. After three months it became clear that Peet was too much for her 16 yr old doxie and too much for her, so he made his way to rescue. Peet is an extremely shy dog. When his new owner babied him, he interpreted that to be a sign that he was the top dog, which made things even tougher for Peet psychologically. He didn’t want to be in charge! He would fear pee and fear poop when anyone came to the house. If they stayed, he barked non-stop unless he could get far away from them (like outside). He would go insane barking on a leash when he saw other dogs while out on a walk. In rescue, we have worked very hard on teaching Peet independence and bravery. We measure his progress in baby steps. For example, he is still afraid of the dog-savvy children in his foster home. However, he will now stay in the room they are in and merely stare at them. When adults come over, he leaves the room, but he does not bark. The fear pooping and peeing has lessened a great deal. Peet does not have an aggressive bone in his body. No matter how scared he gets, he is not a biter. When he is in familiar surroundings with familiar people, he behaves like any other puppy. He loves his people and he loves to cuddle. He has had a ball romping with his canine foster sisters who have really helped him. (For those that follow us, Winnie- formerly Ruby of Ruby’s Rescue Puppies - has been showing him the ropes). .
An in-charge owner. This allows Peet to relax as he does not want to make decisions. A young, confident, sociable canine sibling, preferably an alpha female. This sibling needs to be a dog that greets strangers happily, and that takes new things in stride. A shy dog will only exacerbate Peet’s shyness. A secure yard and a secure front door. Peet is a bolter and will run and hide any chance he gets. Peet has been sleeping in a crate along with his canine siblings. We suggest he continue sleeping in a crate rather than the big bed. (He doesn’t run things, remember?) Peet is neutered, vaccinated and microchipped. If you are interested in Peet, please fill out the online adoption application and email Nicole at Nicolesalacain@gmail.com. An adoption application and home check are required. Size: Chunky Tweenie – 16 lbs. Lucille was picked up as a stray. Despite wirehaired dachshunds being fairly rare, no one came looking for her. The animal control officer at the shelter contacted us to see if we would take her into rescue. A foster raised her hand and Lucille was saved. Our little Lucy is chubby and stubby. She has short little legs and a well rounded booty. (We are working on slimming her down). She is also adorable! Lucille is fostered in a home with children age 8 and up and is doing great with them. She is also good with the other dogs, but it appears she would also be fine as an “only dog”. She walked by cats at the shelter and had no interest in them. She enjoys being with people. So far, Lucille has not been a barker, so she may be do OK as an apartment or condo dog. She is doing very well on her housebreaking. She really is a laid-back, go-with-the-flow dog. Lucille has been spayed and gotten a dental. Her vaccines are up to date. She has been microchipped. She sleeps quietly in a crate at night. If you are interested in Lucille, please fill out the online adoption application and email Nicole at Nicolesalacain@gmail.com. An adoption application and home check are required. Size: Tweenie – 15.5 lbs. Honeybear has an all too common story: He was picked up as a stray and no owners ever came looking for him. When his time was up, the tiny shelter he found himself in asked if we could take this charming dog. How could we say no? Our charming Bear is a very sociable guy. He likes to follow you around the house and talk to you while you go about your business. He loves to sleep on the couch cuddled up against you when you watch TV. He’s an extremely sweet, snugly boy. There is a possibility that he is hard of hearing/deaf, but he could just have a serious case of dachshund selective hearing. Bear has been fine with the other dogs, but we think he could happily be an “only dog” as people are his focus in life. He likes being wherever his people are. Honeybear is a big softy and he finds cats very scary. He is a big proponent of walks and is a good boy on a leash. He is patient and sweet and has a gentle disposition. We think he would be fine with older respectful children. Honeybear is neutered, vaccinated, microchipped, and just had a dental. If you are interested in Honeybear, please fill out the online adoption application and email Nicole at Nicolesalacain@gmail.com. An adoption application and home check are required. Size: Tweenie – 13.5 lbs. Please note: This is a courtesy listing for another rescue group. Rudy showed up at the SPCA in SF in need of oral surgery (multiple fractures in jaw). They removed his lower jaw and he has been staying in a foster home while he heals. Since he doesn't have a lower jaw, his tongue hangs out! It's actually pretty sweet. He can eat just fine – they just give him wet food and add a little water to it. He doesn't drool - he's just a little goofy looking. Rudy loves the 5-year old daughter in his foster home, and he is wonderful with her. He is also fine with other small dogs, especially of the female persuasion. We don't know how he would be around big dogs, but we don't have any reason to think he would have issues. We also don’t know how he feels about cats, but frankly, he’s of little threat without a lower jaw. Rudy is really very sweet and spends most of his time curled up in a ball on his foster sister's bean bag or on the couch with his foster family. He is also hilarious in what they imagine is typical dachshund behavior (burrowing into blankets, jumping up and down, defying gravity when he is excited.) He also loves to sing with police sirens and fire trucks. Rudy is getting a refresher course in house training. His foster mom reports that he is now over 90 percent reliable. Rudy is crate trained, and he regards his crate as his bedroom and sanctuary, often just going in there to curl up for a quick nap. He sleeps in his crate at night, but really wants to sleep in the big bed with his people. Rudy is up-to-date on shots, is neutered, and microchipped. For more information on Rudy, feel free to contact Dawn at dawn.blessing@yahoo.com. SCDR will be forwarding applications to Dawn Blessing. A home check is required. The adoption fee for Rudy is $175.00. Size: Mini – 8 lbs. Nikky is an adorable chiweenie puppy. His previous owner had no idea how much responsibility raising a puppy was, and really didn’t have time to devote to him. Lucky for Nikky, one of our SCDR foster/volunteers lived across the street, and she offered to take him into rescue to find a better home. Nikky is a wonderful puppy, friendly, affectionate, mischievous, curious, and silly. He’s highly intelligent, so should respond quickly to training. He’s going to need some training and consistency to become a great family dog. Nikky loves other dogs, and wants to play. Nikky would not be good in a home with senior dogs. He will bug them constantly to get up and play with him. He needs a young, active companion. One that is slightly older than him, so he can have a mentor and a playmate. Nikky is good with respectful children over 8 years old. We don’t know if he is safe with cats, but as he is very young, he can learn to be nice to the kitty. Also, as Nikky is slightly taller than the average dachshund, a home with stairs is a non-issue. Nikky learned the dog door in right away in his foster home. However, he still needs someone to take him outside every couple of hours and stay out there with him to praise him for a good potty. He will not truly “get it” until he is over a year old. Nikky is crate-trained and sleeps through the night in a crate. He is already begging to sleep in the big bed under the covers with his person. He loves to be held and cuddled. He gives amazing kisses. Someone at home most of the day, stay-at-home parents, or folks who work from home. Another small, young dog for play and companionship. A very secure INDOOR place for the puppy to be when no one is at home. Applicants must be between 25 and 65 years of age. No infants or toddlers, please, but we will consider families with children over six years old. Nikky is neutered, his vaccines are current, and he is microchipped. If you are interested in Nikky, please fill out the adoption application and email Nicole at Nicolesalacain@gmail.com. Size: Small Tweenie – 13 lbs. Sebastian and his littermate were found wandering as strays in a small Central CA town. No one ever came looking for them. The tiny shelter is run by volunteers who reached out and asked us to help the brothers. We happily agreed. Sebastian is an extremely charming dog, but he was extremely shy when he arrived. He and his brother would try and hide behind each other when in any new situation or seeing any new person. In order to encourage the development of their independence, we split the boys up. Sebastian has been going on outings and walks and learning the world is not so scary after all. Sebastian is friendly with people. He is good with other dogs. Sebastian is not a candidate to be an “only dog”. He must have another young, confident dog in his forever home. Older respectful children would be ok with him. He loves hanging out in the yard, so we would prefer a home with a back yard. Sebastian is a young dog. This means daily walks and adventures to help wear down his puppy energy and to continue to socialize him. Sebastian is a quiet dog. As he gains confidence, this may change. We have had Sebastian neutered, microchipped and vaccinated. He crates nicely at bedtime. If you are interested in Sebastian, please fill out the online adoption application, and email Nicole at Nicolesalacain@gmail.com. An adoption application and home check are required. Size: Small Tweenie – 12.5 lbs. Lucy’s owner had a stroke, so Lucy became homeless. This poor girl has been bounced around ever since. First was the neighbor who cared for her for a few weeks. Then to her first foster home. From there she went to our medical foster home on a temporary basis, so she could get a dental. Now she is in what we hope his her final foster home. Lucy is an incredibly sweet dog although all the changes have made her a bit clingy. If her people are home, she wants to be with them as much as possible. Lucy is friendly from the get go but she will need some time to get comfortable and to feel safe. She loves everyone so a home with respectful children would be fine with her. She enjoys playing with the other dachshunds and would find having a canine brother both fun and comforting. Lucy has funny ears. They stand out from the side rather than hanging down properly. We think it adds to her character. She really is one very nice dog. Lucy is healthy and current on her vaccinations. She just had a recent dental. She crates quietly at night. If you are interested in Lucy, please fill out the online adoption application and email Nicole at Nicolesalacain@gmail.com. Adoption application and home check are required. Size: Mini – 8.5 lbs. We decided to give Timmy, a doxie-chi mix, a Christmas miracle. He was on a local shelter’s rescue only list with a comment that he was a fear biter and had bitten an AC officer. We saw his picture for weeks, but no one saved him. So in the spirit of the holiday season, the day before he was to be put to sleep, we decided to take a chance on the little guy. In person, he is the cutest thing with the sweetest little worried look on his face. Timmy loved his foster mom from the moment he met her. He was also terrified of her getting too close to him. He wanted to be close to her, but still maintain a safe distance. He was ignored for a few weeks and allowed to progress at his own rate. He slowly started tolerating being pet and ear scratches (he is very treat motivated). Then one day, his foster mom decided it was safe to pick him up, and he has been easy to handle since then. He adores getting human affection and attention and is always eager for lap time. Timmy is a weird little guy. While in foster care, he has been playing the role of Drew Barrymore in 50 First Dates. If his foster mom wears different shoes, or clothing, he freaks out about the “stranger” and runs for safety out the dog door. It takes him about 5 min to accept that he knows this person after all. Timmy loves playing with most of the doxies in his foster home. However, he is extremely jealous of the male dachshund that arrived after him. The best home for Timmy will have a confident small female sister or two to romp with and help remind him to be brave. Timmy will need a home that will give him a few days before they try and handle him. (Or you can come visit a few times before taking him home.) For this reason, a home without children would be best. Timmy is neutered, microchipped and vaccinated. He crates nicely at bedtime although he really wants to be the first one out in the morning. If you are interested in Timmy, please fill out the online adoption application and email Nicole at Nicolesalacain@gmail.com. An adoption application and home check are required. Size: Mini – 11 lbs. We first became aware of Ella when we were sent her shelter picture. She was shockingly and heartbreakingly thin. Of course, we had to say yes to her. She gained weight prior to leaving the shelter and continued to gain while with us. Her bloodwork at the shelter indicated she had been starved and was dehydrated. We had more bloodwork done after a few weeks in rescue and everything was now within normal limits. Ella has always been sweet with people, but she was a little snarky with the other dogs at first. This was most noticeable as resource guarding at meal times. Due to her past starvation, we gave her a pass on this behavior. With time, a reliable mealtime and some training, she is beginning to relax and cuddle with the others. She is now starting to try to play with some of her foster siblings. She is most likely an “alpha female” who will always want to be the top dog in a pack. Ella needs a home as an “only dog” or with a calm canine brother. Her new owner will need to continue to work with Ella on her resource guarding and fears. She very much wants to please her people and loves attention, so she is proving easy to train. Ella also needs a home that is active. The vet aged her 5 to 7, but she acts like a much younger dog. She wants to get out and about! Ella’s physical condition is much improved since she has been getting regular meals. While her ears are just beginning to grow hair again, the bald spots on her coat are filling in nicely. Ella has now been spayed, vaccinated and microchipped. We also gave her a complete dental where she lost a few painful teeth. If you are interested in Ella, please fill out the online adoption application and email Kari at kparadiso2705@yahoo.com. An adoption application and home check are required. Size: Mini – 12.5 lbs. Fast forward a few days, and we got an email from the new owners. The sweet, quiet, calm puppy they met in the shelter was anything but. They were not prepared for her energy level and the chaos a puppy can bring. Wanting to be sure she would get an appropriate home, they asked us to take her. Lulu was a very rude puppy with no dog manners when she arrived in rescue. The other dogs quickly taught her what is and isn’t appropriate behavior. Now they enjoy playing with her. Lulu is very people friendly and solicits attention from humans. We think Lulu would be ok with kids 8 years old and up. However, we warn you, she is going to chew on any Barbies, Transformers, Legos, or any other toys left where she can get them. She loves to grab anything of interest to her people and run off with it. Lulu will need an active home. She needs daily walks, adventures, and hikes to wear her out. She would love another friendly dog to play with. No infants or toddlers, please, but we will consider families with children over 8 years old. Previous puppy experience is a plus but not absolutely essential. Lulu is spayed, current on her vaccinations, and is microchipped. She will sleep quietly in a crate at night. If you are interested in Lulu, please fill out the online adoption application and email Nicole at nicolesalacain@gmail.com. An adoption application and home check are required. Size: Chubby Tweenie – 16 lbs. Another rescuer alerted us to a Facebook post looking to rehome two seniors that were living outside. One was a doxie (the other dog we connected with someone else). These poor dogs were outside 24/7 in Central CA where the temps get extremely high in the summer and cold in the winter. When Precious arrived, she was anything but precious. She stunk to high heaven. Her coat was a full of mats all the way to the skin. Needless to say, first on the agenda was a visit to the groomer. We thought she would have to be shaved, but the groomer spent hours brushing her and de-tangling her coat. She is now as gorgeous on the outside as she is on the inside. Precious may have been a backyard dog in her prior home, but we don’t believe this was her first home. This girl has lovely house manners. She only gets up on furniture if invited. She uses the doggy door. Her excited dance when she sees a leash means somebody must have taken her for walks at one time in her life. Precious is a very happy, friendly dog. She will flip over for a belly rub faster than you can say “hi”. She loves walks and car rides. She is just an all-around, easy wonderful dog. If you are interested in Precious, please fill out the online adoption application and email Nicole at nicolesalacain@gmail.com. An adoption application and home check are required. Eddie was surrendered to a Central California “high kill” shelter because his family said he was too old and they wanted a younger dog. If we hadn’t gotten him out of there quickly, he would have been euthanized for the same reason. We were delighted to rescue Eddie. Eddie was in pretty bad shape when we got him. Clearly his family didn’t spend any money to care for him. He went to the vet and got neutered and had some benign growths removed, but most importantly, he had a dental. He had every single tooth removed except for one, which is being used as a splint to keep his jawbone in place to heal. That tooth may likely eventually need to be removed. The vet said it was the worst mouth he had ever worked on. Poor Eddie. Eddie’s food must be softened for him to eat. He also has a very sensitive stomach. After a couple of tries, we finally found a food he likes. He is also getting Pepcid AC (over-the-counter Famotidine) before his meals. Also, Eddie’s back was painful when he first arrived at his foster home, but with some rest he made a complete recovery. As with all doxies, he will need doggy-steps up to the couch and the big bed. He WILL jump which would be bad, and steps are really helpful to prevent re-injury. Eddie is an incredibly sweet, kind and sensitive dog. He absolutely loves to go for a walk and that is non-negotiable. He needs someone who will take him on a good daily walk every day. He will stick by your side and just hang out if you are working from home. Eddie is safe with children over 8 years old. (No babies or toddlers please.) We were not told how he feels about cats, but as he has a very gentle nature, and no teeth save one, he really does not pose a threat to a dog-savvy cat. Proper introductions and supervision would be recommended until both he and the cat have established a peaceful relationship. Eddie loves to sleep in bed with both his human AND his other dog friends. He really likes having a dog buddy, and he would do best with another small dog for companionship. He really loves everyone – men, women and kids. He has a bad habit now of barking at strange dogs, but he is easily correctible. He barks when he’s getting leashed up and fed, because he is so excited. Eddie needs a home all on one level (stairs would need to be blocked) as his legs are extra short and going up and down a flight of stairs would be detrimental to his health. No condos or apartments either, as this type of home present a “barking problem”. Living in very close proximity to lots of outside noise and foot-traffic would result in complaints from neighbors. Eddie has a very BIG, loud bark. Eddie is house trained, and knows how to use a doggy door. He goes out by himself periodically during the day. However, he will NOT go out by himself after dark, so he needs to be escorted outside on a leash for that last potty before bedtime. Anyone who adopts Eddie is going to be truly blessed. He is a “love bug” and one in a million. If you are interested in Eddie, please contact Carrie at caretoride@yahoo.com. A home check and an adoption application are required. Size: Small Tweenie – 13.5 lbs. 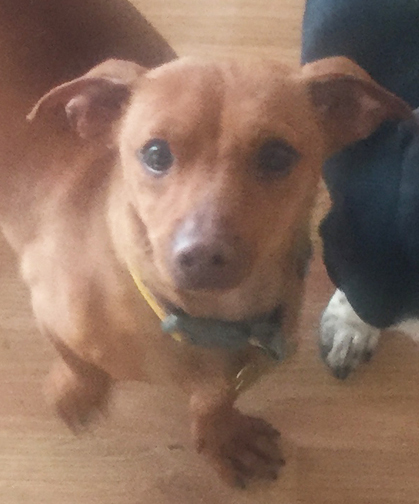 This chiweenie came to us from SFACC. He was totally terrified in the shelter, so they asked if we could take him. He’d clearly had a rough life as he was extremely thin (he was rated a 3 out of 9 on body condition). When Sergio arrived in rescue, he was, to put it bluntly, “weird”. He acted as if he had never seen or heard anything. Other dogs appeared to be a new thing for him and it took him a bit to figure out their behavior. He had zero expectations about people and showed no interest in them. For a long time we debated whether Sergio was deaf. Then we wondered if he had vision issues. He totally ignored all human conversation. A high pitched “are you a good boy?” got not even a glance. Treats? He ignored those too. Well, now with hindsight it is clear he is not deaf and he can see just fine. We think he had just not ever had a human talk to him before, so he paid no attention to our sounds. Getting goodies from a human was also new to him. After time in foster care, Sergio now knows that humans talk to him. He responds to commands and he knows his name. This former treat rejecter now comes racing to get in line when treats are being given out. What lights Sergio up like a Christmas tree, is the young man in his foster home. He worships him and waits eagerly at the gate for him. He likes being held and cuddled by his person. He is much more suspicious of his foster mom, but our female dog walkers have helped him get a little more comfortable with women. Sergio is not a dog for kids (although he lets them pet him on walks). Their shrieking and antics will likely stress him. His ideal home will have at least one male adult. Sergio really wants a dad. He would be happy to be an “only dog”. Another small dog is fine although it might be best if his canine sibling were easy going and confident. Sergio loves to go for walks. He also enjoys sunbathing. He does not bark at squirrels or strange sounds. Sergio is miserable in his foster home. There are way too many dogs and way too many new dogs arriving. He just gets comfortable with the pack and then a new member appears and upsets him again. Sergio wants a quiet, orderly home life. He loves structure and predictability. Sergio is neutered, microchipped and current on his vaccinations. He had a complete dental (but he didn’t lose a single tooth). He is crate trained. If you are interested in Sergio, please fill out the online adoption application and email Nicole at nicolesalacain@gmail.com. SCDR is a 501(c)3 Non-Profit Organization. Saving lives, one dog at a time.